that he found his calling: observing and imaging the solar chromosphere. Now, Greg is tuned into the daily activities of the sun and is always searching for new ways of enhancing the view of our ever changing star. Piepol is constantly involved in educational outreach to the public through his live demonstrations. 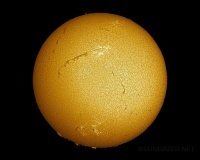 His images are used in public, governmental and educational resources and have been featured in everything from National Geographic to NASA’s Astronomy Picture of the Day (APOD), MSNBC, The History Channel, The American Heritage Dictionary, Spaceweather.com and thousands of blogs, newsletters, presentations and school reports worldwide. Publications include Capturing the Stars: Astrophotography by the Masters, The Sun and How to Observe It, Sky & Telescope, Astronomy Magazine, and Nature magazines to name a few. His images have been featured in various science settings around the world including the Smithsonian's National Air and Space Museum, the Children’s Museum of Ontario, Shanghai Science Museum, Randall Museum and the Adler Planetarium, Montreal Planetarium and Schreder Planetarium. His in-person appearances include The Space Telescope Science Institute, the Northeast Astronomy Forum, Winter Star Party, Coronado Hands on the Sun, Arizona Sun Conference, East Coast Imaging Conference, North East Astro Imaging Conference, Mid-West Imaging Conference. Greg's Pro-Am collaborations include The National Science Foundation (NSF), NASA/Jet Propulsion Laboratory, The Helio-Research Institute and the Solar and Heliospheric Observatory. He is also a founding advisor and member of the Meade 4M Community (Solar Section). In 2009, two of Greg's solar images were featured in "From the Earth To The Universe" (FETTU) global travelling exhibition initiated by the International Astronomical Union (IAU) and the United Nations Educational, Scientific and Cultural Organizations (UNESCO). This International Year of Astronomy (IYA2009) project brought astronomical images to non-conventional science locations on a truly global scale. The program was shown to millions of people at over 250 locations in 70 countries. Greg's latest astronomy article "Catch the Nearest Star" appeared in Sky & Telescope magazine. It's no secret that Greg's passion is public outreach. Greg explains: "Observing our star provides one of the most memorable experiences in amateur astronomy. A person's first look at the sun through a properly equipped telescope is not quickly forgotten and can be compared to the first time they saw Saturn in a telescope. It's that good!" 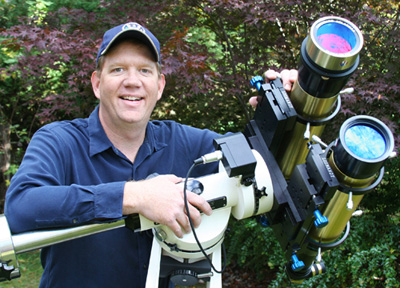 A recipient of the 2011 AstronomyOutreach Award (the "Astro Oscar") Greg has won numerous awards, including the 'Astronomical League's first ever Webmaster of the Year" award in 2003. He was awarded the Telly Award for his contributions to Astrocast.tv. His website won further recognition with Griffith Observatory's Star Award for its promotion of astronomical awareness. Greg regularly displays his equipment at outreach events held by the Northern Virginia Astronomy Club (NOVAC). Greg first became interested in astronomy during the Voyager spacecraft launches in the 1970s. He spent 20 years on active duty with the United States Air Force and has traveled to 33 countries. In 2003, he was a guest at the last launch of the Space Shuttle Columbia (STS-107) at the Kennedy Space Center. This page has been accessed 96,942 times.